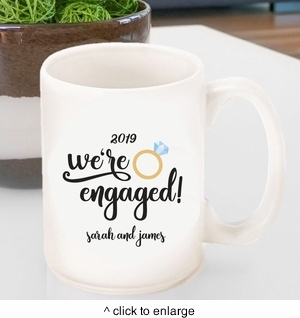 Details:Make a splash during your engagement announcement with our attractive Personalized Coffee Mug- We're Engaged! Our personalized coffee mug can serve as a thoughtful home décor keepsake for immediate family and your closest supporters and dearest friends who are celebrating joyously with you. Measurements:3 1/4" x 4 5/8"; Holds 15 oz.